The darkness of winter is upon us. If you suffer seasonal affective disorder, you will understand the debilitating exhaustion, apathy and moodiness that affects many during the dark months of December and January. Seasonal affective disorder is described by the Mayo clinic as a change in circadian rhythm and a drop in serotonin levels brought on by reduced sunlight in the winter months. For the SAD sufferers, Decembers are punctuated by feelings of isolation, sadness and inexplicable exhaustion. Depression, especially a variation as misunderstood and seemingly benign as seasonal affective disorder, is hard to talk about. So mostly, they don’t talk about it. They hang out at home, sleep a lot and eat a lot of carbohydrates. These three traits lend themselves to a frustratingly negative sense of self. Resting a lot and spending time alone is not necessarily negative, especially during the cold dark months of winter, but if the SAD sufferer feels that such behaviour is unhealthy, then the self-blaming and feelings of worthlessness manifest themselves. Yoga is a reprieve from those negative thoughts and a distraction through breath and movement. 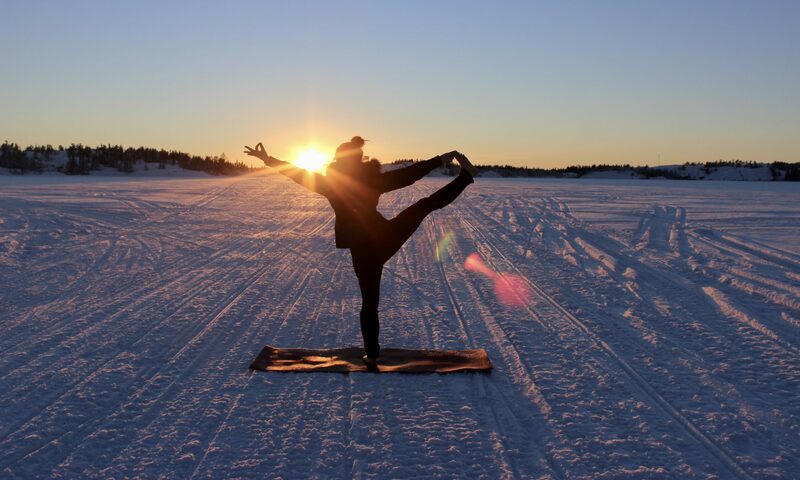 Anecdotally, there is evidence that yoga is specifically beneficial for Seasonal Affective Disorder, but objectively any physical activity will do. The advantage of yoga is that it can be done anywhere and at any time of day. There is no special gear, you don’t need a partner, it doesn’t have to cost anything and it doesn’t matter if it’s dark out. There are yoga studios in almost every town or city, and even if you have never tried yoga, I guarantee that you will be welcome at whatever studio you walk into. And if you don’t feel like going out to go to yoga? There are excellent online yoga classes. I maintain a membership with yogaglo.com during the winter and am always impressed with the wide range of classes and teachers the site offers. You don’t even need a yoga mat to start. A beach towel or blanket works really well, especially on a carpeted floor. So if Seasonal Affective Disorder affects you at this time of year, see if a daily yoga practice mitigates the effects. It’s not that socializing less and eating more carbohydrates in the winter is inherently bad, the problem is when your actions make you feel bad about yourself. Yoga’s focus on breathing and moving can offer a reprieve from the negativity and the low self-esteem that results from the SAD symptoms. This was such an honest and insightful post. I’ve been reading your blog for months, and am learning many new things (about yoga…about life…). Thank you for all of this. You are a beautiful writer. Next PostNext Are you a believer?